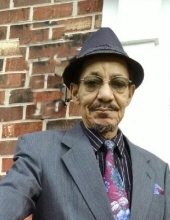 Samuel A. Harris departed this life on Saturday, December 29, 2018 at VCU Medical Center. He was born April 14, 1956 to Evelyn and Joel A. Harris, Jr.
At an early age, he joined Liberty Baptist Church. Samuel attended Amelia County Schools. He graduated from the Virginia School for the Deaf and Blind in 1977. Samuel was employed by Richmond Lumber Company in Richmond, VA. He also worked at All Aboard Furniture Company until his health failed. Samuel was a long-time member of the Deaf Association and the Pro Anglers Bass Masters. He enjoyed spending time with his only grandchild, his family, hunting and fishing. He loved fishing trips. Samuel was preceded in death by his father, Joel A. Harris, Jr. and a brother, Franklin R. Harris. He leaves to cherish precious memories: his long-time companion, Ella Wood; one daughter, Elisa Wood; one grandchild, Serenity Price; loving and devoted mother, Evelyn L. Harris; three sisters, Alice A. Harris and Donna Harris, both of Richmond, VA and Viola A. Booker of Amelia, VA; one aunt, Elizabeth Hawthorne of Richmond, VA; one brother-in-law, James E. Booker, Jr. of Amelia, VA; four nieces, Juliane (Boyce) Hicks, Jennifer (William) Cooper, LaFonda Booker and Jasmine Harris; two nephews, Michael Coleman and Jordan Harris; one great nephew, Demontre Thompson; special devoted friends, Brian Banks and Boyce Hicks; a host of cousins and loving relatives and friends. Funeral Services Saturday, January 5, 2019 at 1:00 p.m. at Liberty Baptist Church, Amelia. Interment church cemetery. To plant a tree in memory of Samuel A. Harris, please visit our Tribute Store. "Email Address" would like to share the life celebration of Samuel A. Harris. Click on the "link" to go to share a favorite memory or leave a condolence message for the family.